That's when the demon bursts out of the manhole and grabs him. It happens in a blur, and is so fast, so violent, so shocking, that several people in the crowd cry out with alarm. The demon is green, slimy, with fierce yellow eyes, four long arms with claws at the ends, a mouth full of fangs. It whips Emmet off the ground. He screams, not having to fake it, caught off-guard. "Now that's what I call a death scene!" David R. Hayms roars triumphantly, shattering the spell of fear. "Cut! Did you get that? We'll never top that take!" 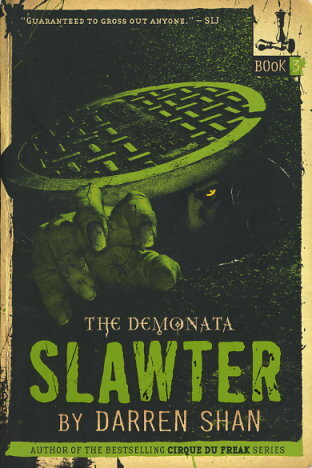 The horrifying adventures continue with the third book in the Demonata series.